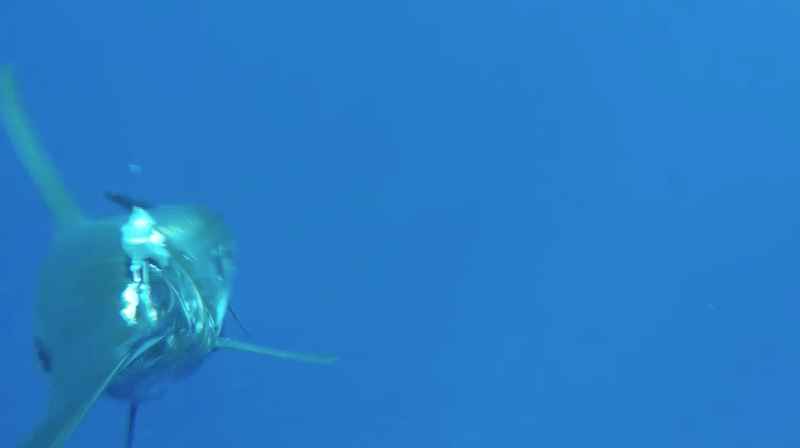 The 2019 season of the popular offshore fishing show Into The Blue starts off with a bang as diver Jake Perry survives a swordfish attack. The highly anticipated first episode of the famous fishing show with hosts Captain Scott Walker and Captain Steve Rodger titled “The Lessons of Swordfish” covers all of the intricacies of fishing for the large beasts deep below. In this episode not only do these Captains and long time guides cover all of the ways they fish for these majestic creatures, but their long time underwater cameraman survives a close encounter that could have very easily ended his life. Jake Perry underwater cameraman for Into The Blue for over 9 years grew up in the water. He grew up in the Florida Keys catching lobster and spearfishing and is a natural in the water. Jake is responsible for all of the amazing underwater imagery we have seen over the years. Unfortunately he found himself in “some real estate you do not want to occupy” between the swordfish and the boat. In just seconds the swordfish saw him as a threat and went to stab him with its bill. Lucky enough for Jake, the bill pierced the scooter, and the large fish swam away. Normally the underwater cameraman will try and stay on the other side of the fish when it is hooked so that all the fisherman has to do is give the fish a tug to keep his underwater videographer safe. In this situation Jake Perry was caught in the wrong spot between the fish and the boat and there was nothing Captains Steve or Scott could do to pull the fish away. Jake was very fortunate to come away completely not only alive, but completely scar free. Swordfish can be a very aggressive fish. Often times you can find you catch them and they are covered in bruises from spending their life fighting. They are usually dueling over food, breading or defending themselves from larger predators such as mako sharks. You can often find many mako sharks with swordfish bills in their skin, mouths, or teeth. Watch the full episode of “The Lessons of Swordfish” to see the full story and learn all there is to learn about catching swordfish. Listen to the Tom Rowland podcast to hear more from Captain Scott Walker and Captain Steve Rodger as they sit down for a full interview.